These are typically clawed burrow dwelling animals that seem to be half-shrimp and half-lobster. They belong to the Infraorder Thalassinidea, which includes nine families with over 38 genera, and 80 species in Australian waters. 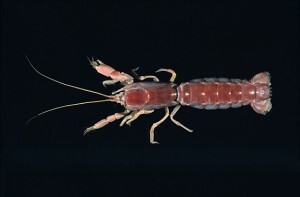 Thalassinideans occur in a wide variety of habitats from the intertidal zone to at least 2,500 metres depth, and range from species that burrow in estuarine mud banks (like the well known marine Yabby), to others that live commensally in sponges and cavities in coral. All are expert burrowers and rarely seen unless hunted or accidently disturbed. Yabby (Callianassa australiensis) Pink Mangrove Lobster (Laomedia healyi): Indigenous; Southern Qld and NSW.